We had a lovely trip upstate to gma and gpa S's house for Thanksgiving. Noah automatically attached himself to the gma's collection of matchbox cars and he loved having a yard to run freely through and kick around some leaves. It was so nice to be able to spend the day with family and not have to cook :)... thanks mom! 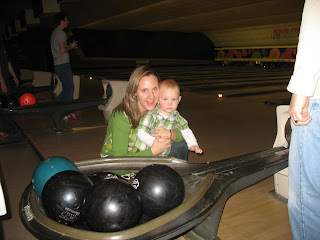 We topped the weekend off with a fabulous bowling trip -- gotta love the 'burbs! 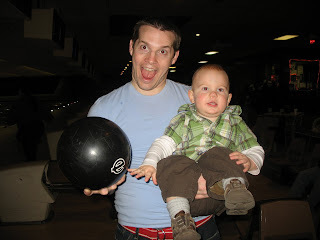 Noah had a blast watching us knock down stuff with giant balls... a toddler boy's dream! He did get frustrated, however, when he tried to lift the balls and he couldn't. 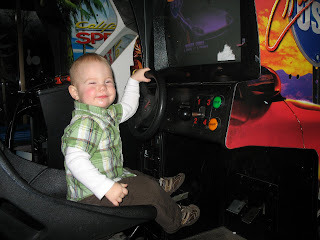 But he was easily distracted by the car video games, and life was good again. It's so easy to get wrapped up in the hussle and bussle of the holiday season and lose sight of the things that we are grateful for. 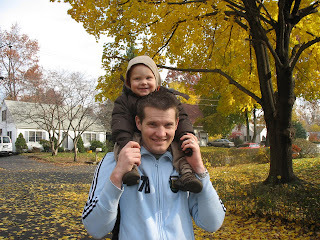 I love Thanksgiving because it always gives me a chance to sit back and think about how grateful I am for what I have. Family definitely tops my list and I was so happy to be able to spend some time with them this weekend. Today was Noah's first day in nursery. Hooray! 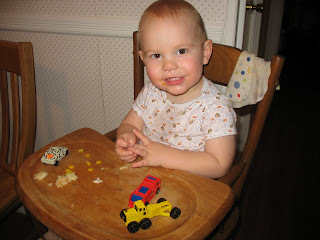 He turned 18 months on Friday which means he is now an official Primary member -- very exciting for mommy and daddy. Honestly, I wasn't sure how he would do. He's into this thing lately where he says "bye" to anything and everything (i.e. 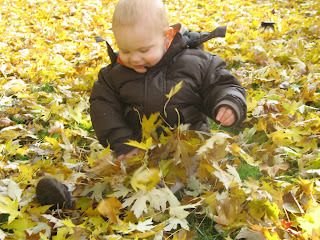 when I turn off the TV, when I throw away food he didn't eat, when he leaves his bear in his crib) -- it's hilarious. So, I was hoping to have the same reaction when I left him in nursery today for the first time. Before church today I tried to prep him by telling him what was going to happen... "today Noah is going to nursery -- yay for nursery! nursery, nursery, nursery! (he's into repeating words a lot lately so I said it over and over again for dramatic effect) You're going to play with new toys, read books, sing songs, have a snack, and meet new friends" -- then I named a few kids he already knows that he would see later -- he got really excited about that. So, when the time finally came, he went right into the room and right for the giant car toy. He was pretty stoked about that. I hung around for a minute until some more kids came and all the teachers were there and then I told him I was leaving. He was really distracted by all the new toys and really didn't care that I was leaving at all. I was a bit worried that he was going to start looking for me and freak out, so I stuck around in the hallway for a bit longer (luckily, they just put a new window in the door so OCD moms like me can peek in and check on their kids). I'll admit that I had a little moment with myself in the hallway -- I got a bit teary-eyed, something I never thought I would do... but my baby is growing up! I can't believe it! Then I got over it and enjoyed the rest of my church meetings (something I haven't done in a LONG time -- we're talkin' before I was RS Pres). I went to pick him up after the meetings were over, and of course he was face-down on the ground crying. YIKES! I knew he was super tired by that point (we're having nap transition issues -- a separate post altogether), but I guess he got pushed right before I got there. His teachers assured me that it had just happened and that he had been fine the whole time, for the most part (they wouldn't lie to me, right?). So, all in all it was a successful experience. I can't wait until next week! p.s. 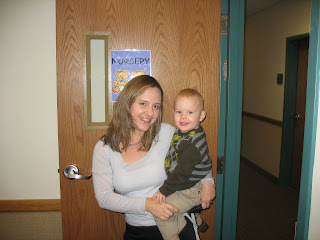 I have a testimony of nursery leaders. 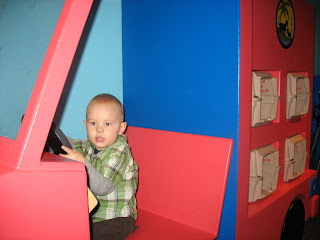 We had a lovely family outing on Friday evening to the Children's Museum of Manhattan and then out to dinner at Ollie's. We've been trying to have an official monthly family outing and so when I heard that the Children's Museum has free admission from 5-8pm on the first Friday of every month, I thought that would be a perfect way to kick off our new goal. Noah had a blast in the giant playspace. He was especially enthrawlled with the giant model fire truck and MTA bus (not surprising at all). 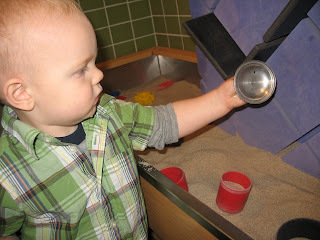 He also got a kick out of the sand table -- but had a hard time understanding why I wouldn't let him climb in it. After he finally figured out that it wasn't a sand box, he was pretty entertained. 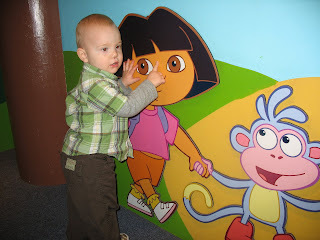 We also checked out the Dora and Diego exhibit on the 2nd floor which was a huge hit (also not surprising). 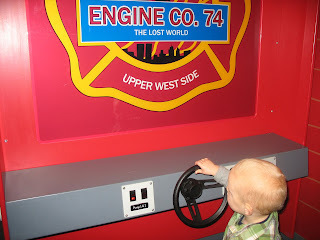 Noah loved driving Diego's rescue truck and playing in Dora's room. 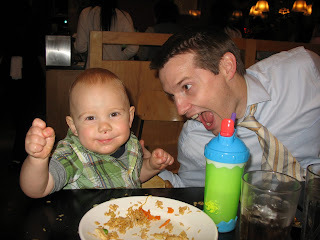 Then we topped the evening off with dinner at Ollie's, where Noah thoroughly enjoyed his plate of fried rice.